Usability and support are as relevant to small mom and pop businesses as they are to global leaders. Take the email AT&T users received yesterday, as proof (see below). ATT.com has updated its Account Overview to give easier access to the items that typically matter most to their users: usage, upgrade eligibility and account alerts. As indicated in the email subject line (You get what you asked for) and copy, these were requested simplifications. 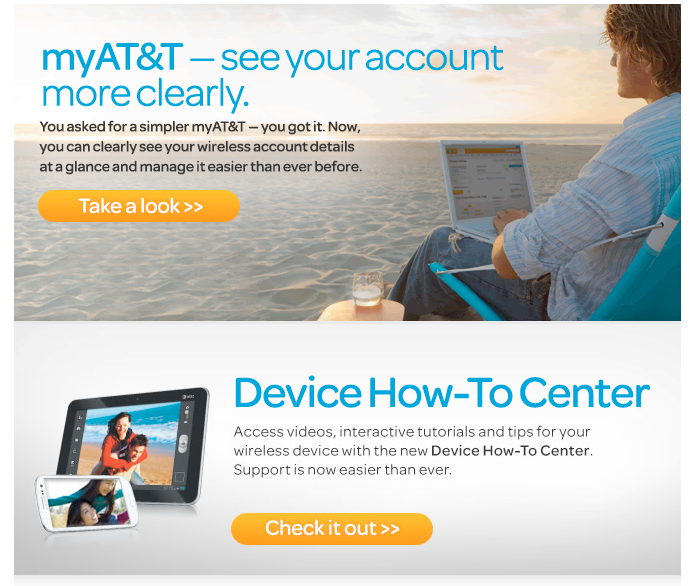 Take a page from AT&T’s book and conduct a survey with your own users. You can use tools like SurveyMoney or a more informal approach, like a Facebook poll or post. You might be surprised by the simplicity of some requests, while others may require more backend work. Either way, you are telling your users that you care about their user experience. Continue to keep an eye on the ‘big dogs’ for practical ways to improve your site and user experience.